Lovely private Studio downstairs in our house. Off the road so quiet with its own private entrance and outdoor area which is fully fenced and gated. Located centrally between the beautiful Mount Maunganui, Omanu Beach and the Mount Golf course. A short walk to Central Parade with great cafes. Walk to the beach or stroll to the golf course. Centrally located for Bayfair shopping mall or the Mounts boutique shops, Baywave swimming complex, hotpools, parks, and Pilot Bay with its water activities including fishing, biking and swimming. Walk along the beautiful beaches and coastal walkways. Fantastic walk up the Mount to view all of the Western Bay of Plenty. In the summer enjoy the fabulous Gourmet Night Markets every Friday from 5 till 9, with free live music and great local cuisine on offer. We have 1 x off-street parking available to our guests right outside the flat. Minimal cooking allowed as this is motel style and why not try our local cafes. We do supply Tea, Coffee, Sugar and small milk on arrival. Toaster, Jug, Coffee Plunger and Nescafe machine. Outdoor BBQ, surf board, bikes available on request. Linen included but will not be changed unless booking is over 5 days. Beach towels supplied and shower towels. Small dogs will be considered on request. We do have a dog on the property (Spoodle) but she cannot enter your private court yard. Couples preferred. 25yrs or older - no parties please. Smoking only outside please., $300 bond to be paid for Christmas/New Year period. Close to all amenities. The mount and airport is just minutes down the road. Nice private and quiet area. Room is spacious. The bed was ok. Perfect for what we needed. Really appreciate you putting the single mattress in for us too. Thanks! 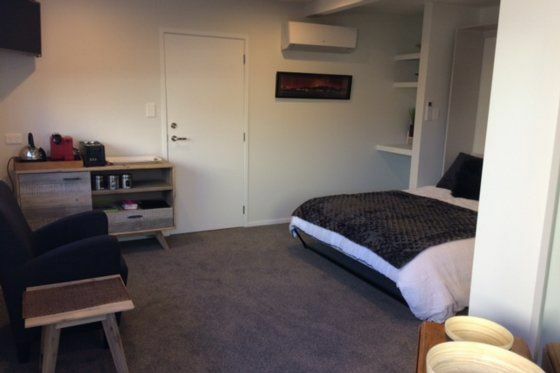 Very tidy and clean studio unit. Good bathroom, comfortable bed, friendly owners. Ideal base if visiting the Bay and don’t need to be too central but close to a nice beach. Thanks, so glad you enjoyed your stay, perfect guests! Property is in a great location, close to the beach and a short drive to the mount. Property is in a great location, close to the beach and a short drive to the mount. Facilities on the property were brand new and the unit had everything needed for a weekend away. Had a great time and would definitely consider staying again. Thanks Colin, you left the unit so tidy. Glad you enjoyed your time away. Welcome any time.